There is a lot of teasing between the father and son, played with endearing casualness by Saif Ali Khan and Svar Kamble. Aptly, Chef teases our appetite for cinema. It’s a culinary delight—warm, tender, inviting and appetizing– served up in a dainty dish with a dash of debonair but played-down posturing, like a masterchef who is shy to show off his skills but can’t help it. He’s so adept at what he does. Chef conveys the kind of sagacious skill born not out of arrogance but wisdom sometimes misplaced. Like the protagonist Roshan Kalra’s traditionalist father who believes the kitchen is for women. Speaking of which—arrogance more than wisdom—Saif Ali Khan’s Roshan Kalra (from Chandni Chowk Delhi married to and divorced from the lovely Malayali danseuse Radha Menon) is portrayed as an epitome of prideful arrogance waiting to fall. The fall comes sooner than we expect. Director Menon wastes no time in taking on his protagonist’s burnished ego and cutting it down to size, piece by piece. Come to think of it, Roshan’s downsizing needs no push. Saif Ali Khan’s inbuilt nawabi pride and an urbane humour that often hurts others in ways that are more permanent than permissible, seize the character to make it so imminently relatable, I felt someone had stolen parts of my life. Saif’s Roshan says things to earn points as a clever conversationalist. Much like the prestigious Michelin star rating for food which determines quality to the point of rendering the pleasure of food into an exercize in technical grading. And here’s where director Menon and his co-writers Ritesh Shah and Suresh Nair score resoundingly over the original Jon Favreau film. Food, as a cultural binder, is a far more vital metaphor in India than in America. Instinctively, Menon understands the deep and indelible connection between food and family in our culture. Much in the same way that music binds human relationships,food is great unifier. The narrative teases the cooking and food into the human relationships without making culinary conceits a fetish in the plot. Food is vital but not in-your-face in Menon’s Chef. This director understands the difference between appetites and feelings. He tightens the screw on his protagonist’s arrogance whenever Roshan Kalra’s failings become the food for his feelings. This guy, played so intelligently and persuasively by Saif, doesn’t know where to stop. Sometimes the banter between Saif’s Roshan and those close to him, turns ugly. But that’s life. The relationships that govern our existence are not always based on sweetness and positivity. The dark side is always there, lurking in the corners of life…lurking lightly and gently at the backdrop of Raja Krishna Menon’s fourth feature film (he actually came into his own with his third, Airlift). It is to Menon’s credit that he keeps the proceeds airy and light on the top but allows us a peep into the darkness beneath just when we begin to savour the blitheness. The father-son relationship is paramount to the plot. It works with blessed vigour. 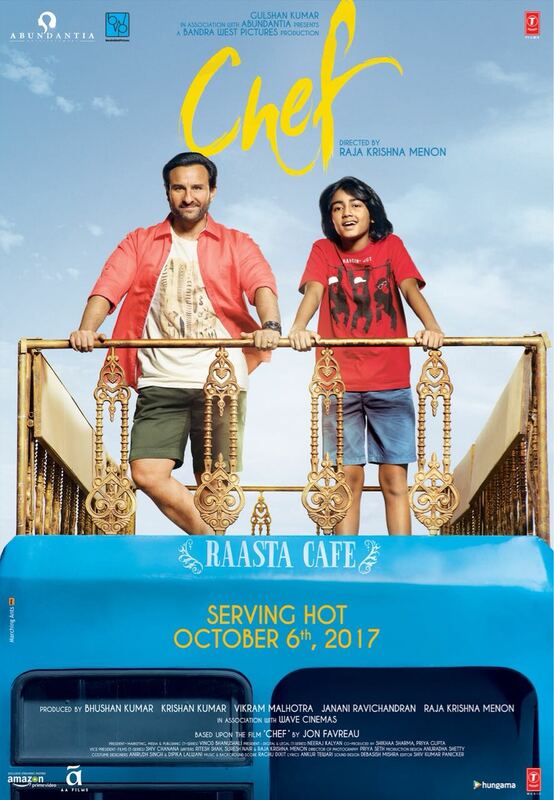 Saif and the boy Svar Kamble look and feel for their parts. They are born to play a family. Menon is not impatient to tell Roshan Kalra’s story. The narrative’s pace in unhurried but never dull. There is a lingering grace to the mise en scene. And I refer not just to the father-son scenes. Saif’s longish sequence with his girlfriend (Sobhita Dhulipala) in New York after she takes over his chef’s job in a restaurant where he has an altercation with a client, is written with so many subtextual interjections and prickly hurt-points polished down to injury-proofness, it’s like walking a terrain mined with explosives. I only wish the music and songs were better. If food is seen as the strongest cultural metaphor in Chef, music which has been described by a wise man as the food of love, gets a raw deal here. Also the climactic denouement (airport run, traffic snarl, breathless reunion) could have been avoided in a film that pretty much dodges all the signposts of smart-mart filmmaking to forge its own languorous grocery-store language of estrangement and reconciliation. A major of the film’s lingering charm emanates from the casting. Menon has cast so authentically it almost feels as though the actors were destined to play these parts. Whether it’s Saif’s Punjabi chef or his screen wife, the very elegant Padmapriya’s as his Malayali wife, or Chandan Roy Sanyal as Saif’s faithful Bangladeshi pal, or Dinesh Prabhakar as the sodden cantankerous but ultimately goodhearted driver chosen to man Roshan’s mobile bus-restaurant…they all exude the scent of supremely believability without making a song-and-dance of it (wish they could, though, if only the music didn’t let them down). And yes, cinematographer Priya Seth gives us one more reason to celebrate life. Kerala has never looked more inviting. After watching Kerala play the lead in Chef (with due respect to Saif) I’ve decided to head there. Preferably with my child. 16 queries in 0.310 seconds.